David faces Goliath in single combat. Goliath (גָּלְיָת Hebrew Golyat) was a legendary Philistine warrior written of in the Bible. A descendant of Rapha in a lineage of giants, he is most famous for his battle with David, the young patriot who would later become the King of Israel. In rabbinical tradition, Goliath, hailing from Goth, one of five ancient city states in Philistia, is said to be the very warrior who had earlier captured the Ark of the Covenant from the Israelites in the mid eleventh century B.C.E. The account of David and Goliath (Jaloot) is given both in the Hebrew Bible and in the Qur'an. Recent archaeological evidence suggests that even if no race of giants actually existed in Gath at this time, a name similar to "Goliath" was indeed used in the area. An alternate biblical account says that Goliath was killed by a man name Elhanan, rather than David. In the modern world, Goliath has become the symbol of institutional power and technology in opposition to the underprivileged and the underdog. Among religious people he is evidence that those who stand against God are ultimately powerless, no matter how strong and well-protected they may seem. Goliath hailed from the Philistine city of Gath. Usually, the name "Goliath" is thought to be connected with the Assyro-Babylonian "Guzali," which means "running" or "destroyer." More recently etymologists have related it to the Indo-European name, "Alyattes." One of four huge sons of a man named Rapha, he is traditionally thought to be a descendant of a legendary race of giants called the Nephilim. These "men of renown" supposedly originated when angelic beings or gods ("ben-elohim"—the sons of God) had mated with human females in the time of Noah (Gen. 6:4). They are again in evidence when the Israelites sent spies to assess the feasibility of conquering Canaan in Numbers 13:33, indicating that they seem somehow to have survived the Flood. Goliath was reportedly over nine feet tall and was unparalleled as a warrior, his weapons of choice being the sword, spear, and javelin. His spear shaft was so thick that it was compared to a weaver's beam, and its point was made of iron. This gave him a huge advantage not only in size and strength over his opponents, but also an edge in technology, since the Israelites did not yet possess iron weapons. When arrayed for battle, he wore a bronze helmet on his head and an immense coat of heavy bronze scale armor on his body. His legs were protected by bronze greaves, leggins. Unfortunately, little is told of Goliath's exploits before the day of his battle against the young David, but they must have been impressive indeed. Rabbinical tradition says that he boasted of being the Philistine warrior who had captured the Ark of the Covenant, (1 Sam. 4) slaying the two sons of the sanctuary priest Eli in the same battle. He is described as being strongly devoted to the god of the Philistines, Dagon. Goliath's battle against David is summarized as follows: According to 1 Samuel 17, during the reign of King Saul, the Philistine army gathered in the land of Judah to make war on the Israelites. The army set up camp on a hill overlooking the Valley of Elah, while the Israelites under Saul camped on the opposite hill. Goliath positioned himself between the two armies and challenged the Israelites to send out a warrior to meet him in single combat. If the Israelite champion prevailed, the Philistines would become the subjects of Saul. If Goliath won, the converse would occur. For 40 days, in both the morning and evening, Goliath issued his challenge, taunting the Israelites and insulting their God. However, no man came forward to meet meet him. The young Hebrew David hoists the severed head of the mighty Goliath. David was the youngest of the eight sons of the Bethlehemite Jesse. When delivering food to his brothers on the battlefield, David heard Goliath's haughty challenge and burned with anger. The youth came to Saul and offered to fight the giant. Though initially skeptical of David's capacity to defeat Goliath, Saul was persuaded to allow the match after the young Bethlehemite detailed his previous victorious encounters with a bear and a lion. David rejected the king's offer of armor and a sword and went out to fight Goliath with only a staff, sling, and five smooth stones he had taken from a nearby stream. Goliath sent his shield-bearer before him, moving slowly closer to the Israelite champion. Seeing that he was in reality only a boy, Goliath took his presence as an insult, believing that the Israelites must send out the mightiest warrior to meet him. "Am I a dog, that you come at me with sticks?" he complained. Goliath cursed David by his own gods, and taunted: "Come here and I'll give your flesh to the birds of the air and the beasts of the field!" In the battle of words, his young opponent proved to be a worthy one, retorting: "You come against me with sword and spear and javelin, but I come against you in the name of the Lord Almighty, the God of the armies of Israel, whom you have defied… Today I will give the carcasses of the Philistine army to the birds of the air and the beasts of the earth, and the whole world will know that there is a God in Israel." Hearing enough, Goliath then closed in to attack. David ran quickly toward the battle line to meet him, using his one advantage: Speed. Reaching into his bag and taking out a stone, he slung it and struck Goliath on the forehead before the mighty Philistine could even attempt a blow. The stone sank into his forehead, and he fell face down on the ground. David then drew Goliath's own sword from its scabbard and cut off his head. So powerful had this mighty warrior been that when the Philistines saw their champion was dead, they ran from the field, and the Israelite army pursued them out of Judah, slaughtering many in the process. The young David went on to be a great warrior in his own right. Hounded by the jealous Saul, he would later fight on the side of the Philistines, becoming the general and vassal of Achish, the king of Goliath's home city of Gath. (1 Samuel 20:10) Eventually, he would become a king in his own right, first of Judah, and later of both Judah and Israel. Such was the man who conquered the mighty Goliath of Gath. A little known later account (2 Samuel 21:19) reports that it was actually not David, but one of his warriors named Elhanan, who killed Goliath. In this version, the battle takes place not at the beginning of Saul's reign, but just after its end. The recently enthroned King David has turned on his former Philistine allies and seeks to drive them out of the territory of Judah. In the course of the ensuing battles, Goliath and his three brothers—the sons of Rapha—are slain. None of them are killed by David himself. Ishbi-Benob vows to kill David, but the king is rescued by Abishai, who was one of David's military officers and the brother of Joab. In another battle, Rapha's son Saph is killed by Sibbecai the Hushathite. At Gath, David's nephew, Jonathan son of Shimeah, kills an unnamed son of Rapha, "a huge man with six fingers on each hand and six toes on each foot." Jonathan kills him "when he taunted Israel." In a battle at Gob, it is a soldier named Elhanan, son of Jaare-Oregim, who kills Goliath, the son of Rapha "who had a spear with a shaft like a weaver's beam." Thus, what the story of "David and Goliath" may be is a legend that takes several earlier stories of battles against giants, combines them into one, and attributes the victory to the young David. Such processes are not uncommon in folk literature. The above account is repeated virtually word for word in 1 Chronicles 20:4-8, except that an editor has apparently inserted the words "the brother of" in front of Goliath's name in order to deal with the conflict between this account and that of David and Goliath. A similar insertion has been made in the King James version of 2 Samuel 21. Quite a lot has been said about Goliath by various rabbinical authorities. Most of these make him out to be a villainous character. For example, Goliath was thought to be of ignoble birth. One legend states that his mother was a Moabitess, Ruth's sister Orpah (Midr. II Sam. 22:16). This would make him a not too distant cousin of David himself. In contrast to the pious Ruth, Orpah led an immoral life after her sister accompanied their mother-in-law Noami to join her kinsman Boaz in Judah. Thus Goliath was of uncertain paternity (Midr. Ruth 1:14). Orpah also bore three other giants beside Goliath (Tan., Wayiggash 8). Goliath's sword, which would later become the sword of David, had miraculous powers (Midrash Golyat). In his taunts, Goliath boasted of having slain the two sons of the judge Eli and to be the very warrior who captured the Ark of the Covenant and brought it to the house of Dagon. Goliath especially targeted Saul with his taunts, accusing him of being a weakling and a coward (Targum to I Sam. 17:8). In some of the rabbinical legends, Goliath's size and strength become almost ridiculously exaggerated. His armor weighed, according to Rabbi Hanina, 60 tons; according to Rabbi Abba bar Kahana, 120 tons (Sotah 48b). His height was also amazing, and the reason that Goliath fell forward on his face was so that David would not have to run far when rushing to behead him. 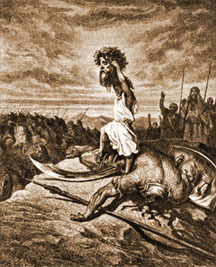 According to Rabbi Huna, Goliath had a picture of Dagon engraved upon his heart. Goliath is mentioned as the typical case where strength leads to downfall, and he died like a dog(Ex. R. 31). Rashi identifies Elhanan, the alternative slayer of Goliath, as being the same person as David. In the Qur'an and Islamic tradition, the story of David and Goliath differs only slightly from the biblical version, but adds some interesting details. The basic outline of the story is given in Sura 2:249-253. Goliath's name is rendered as "Jalut." In Islamic tradition, when Goliath (Jalut) challenged any soldier from King Saul's (Talut's) army to single combat, the king offered the hand of his beautiful daughter in marriage to the man who would fight Goliath. However, even this tempting offer did not change the deadly silence among his soldiers. Then, to everyone's surprise, David (Dawud) stepped forward. A roar of laughter echoed from the Philistine side, and even Saul's men shook their heads. Although Saul was very impressed by David's boldness, he said: "I admire your courage, but you are no match for that mighty warrior. Let the strong men come forward." Proudly, David told the king that only the day before he had killed a lion which had threatened his father's sheep, and on another occasion he had killed a bear. He asked Saul not to judge him by his appearance, for he feared neither man or wild beast. Saul, surprised by young David's brave stance, agreed: "My brave soldier, if you are willing, then may Allah guard you and grant you strength!" Saul worried and asked him how on earth, with a sling and a couple of stones, was David going to defend himself against the giant. David replied: "Allah, who protected me from the claws of the bear and the fangs of the lion, will certainly protect me from this brute!" When Goliath set eyes on the lean young man, he laughed loudly and roared: "Are you out to play war with one of your playmates, or are you tired of your life? I will simply cut off your head with one swipe of my sword!" David shouted back: "You may have armor, shield, and sword, but I face you in the name of Allah, the Lord of the Israelites, Whose laws you have mocked. Today you will see that it is not the sword that kills but the will and power of Allah!" After the battle, David became a hero overnight. Saul kept his word and married his daughter Michal (Miqel) to the young warrior taking him under his wing as one of his chief advisers. Archaeologists digging at Tell es-Safi in central Israel, the accepted location of the biblical Gath, have unearthed a shard of pottery bearing an inscription confirming two names similar to Goliath's. Written in Proto-Semitic letters, the inscription consists of the names "alwt" and "wlt," both of which are etymologically similar to the name Goliath (Golyat in Hebrew) and its Arabic equivalent, "Jalut." They are thought to be semitic versions of an Indo-European name similar to "Alyattes." This find demonstrates that the biblical description of the figure Goliath (in particular, his name), fits in with the cultural milieu that existed in the Southern Levant during the Iron Age IIA (tenth-ninth centuries B.C.E.). The shard dates back to around 950 B.C.E., within 70-80 years of when the biblical chronology asserts David squared off against Goliath, making it the oldest Philistine inscription ever found. Some intriguing medical hypotheses have been made concerning Goliath's size and general health. Given his grossly abnormal height (traditionally believed to have been 9 feet, 6 inches), some have suggested that he suffered from gigantism due to a growth hormone-secreting pituitary adenoma. Given the pituitary's position near the eye, pituitary masses also tend to impinge on the optic fibers delivering images from the peripheral visual fields. 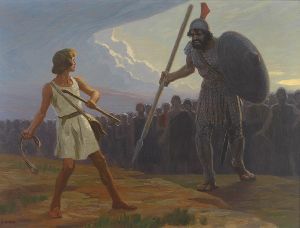 Some have suggested that this may have allowed David to use his superior speed to sneak around Goliath and deliver a fatal sling shot to the Philistine from relatively close range. All About God.com. Bible Verses pertaining to Goliath. Retrieved July 16, 2007. Biblos.com. Parallel Translations: 2 Samuel 21:19. Retrieved March 23, 2012. Jewish Encyclopedia. Goliath. Retrieved July 16, 2007. This page was last modified on 23 January 2019, at 17:21.